The group's Coordinator was today in the country home of the National Leader of BNYL, Princewill Chimezie Richard in the town of Ogwuaga-Abba autonomous community, Abba south, Abba Ancient kingdom, Nwangele local government area, in the Nkwerre nation of Imo State where they discussed on the proposals. The source said that the National Leader of BNYL, Princewill C Richard did not disclose the purpose of the meeting. It quoted the BNYL Leader as saying "that the meeting is an affair of both groups". 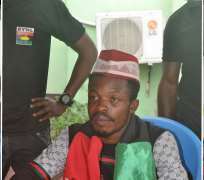 BNYL Leader disclosed that one of the sureties of Mr Nnamdi Kanu, Emmanuel Rabbi was part of this move. There was also a presentation of the book, "The Only Crime of Yahshua the Messiah". It was presented on behalf of the Igbo Jewish group. Another book titled "The Ancient Crime of the IGBOS- Free Slaves In Nigeria" was presented by the Igbo Liberty Forum as well as proposing documents. The BNYL leader disclosed that the BNYL Leadership will be meeting in Cross River to look into some of the proposals while it goes further with it's plan for seminar.